The vultures didn't return after the rain and Spencer interruptions yesterday. I put all the uneaten scraps underneath an upside down bucket for the evening. 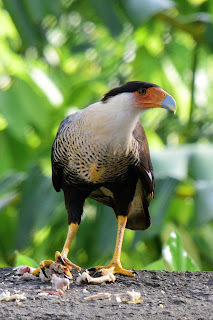 The next morning I removed the bucket and not soon after this Crested Caracara arrived. They usually hang out with the vultures so it was unusual to see this one solo.